Last month, we talked about Modern Comfort, which is one of my favorite ways to combine clean, crisp style with the cozy feeling of home. This month, we’re going to mix modern and traditional decor. This genre is particularly close to my heart, as I live in a 1920s Tudor in Oakland! When my husband and I first bought the home, we fell in love with the large divided-light windows, wood flooring, and original fireplace. But we also had a modern aesthetic and didn’t want a home that felt overly traditional. We are still — yes still... 5 years later — working on renovations and fixing it up (posts to come soon!). That’s right, there are a lot of contradicting themes here — but these opposing characteristics are what make it so fun to merge these genres together! Best part is, Modern Traditional eliminates the common concerns people have for each genre on its own: modern interiors = tendency to feel cold; traditional interiors = bad rep for being grandmotherly. Modern lighting, exposed beams, ornate fireplace... there's so much to love here. Image source. Even though we're talking about modern traditional style, the genre can be used to create any number of atmospheres and moods. It all depends on what you personally like. Here are three well-designed and very DIFFERENT Modern Traditional spaces to help inspire you. 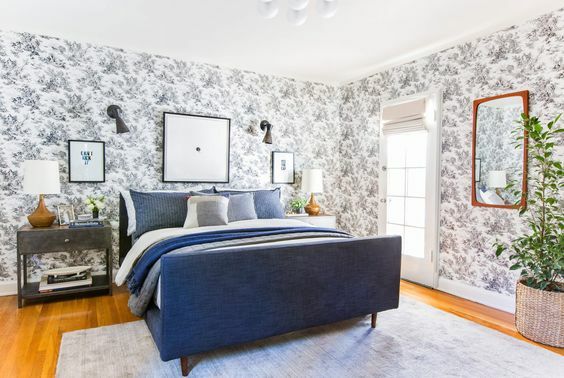 The walls are the first thing you notice in this bedroom. The pattern is very traditional but instead of looking like a trip to granny's, a modern approach keeps it feeling fresh and new. How’d they get this balancing act just right? These are just 3 of many, many ways you can use modern traditional style to create the perfect atmosphere for you. For more inspiration, check out our Modern Traditional Pinterest board! When was the house built and what design genre does it fit into? Are there any architectural details that make the space unique or historical? You may have to make some tough decisions regarding what's worth keeping and what's worth changing. Take an inventory of all the modern and/or traditional pieces you already own and want to keep, and remember that not everything old is functional or well-made — some pieces may need to be altered. Pay attention to the style category of the items you intend to keep... and then comes the fun part... browsing for more! Below are some of my favorite shops and sources for finding modern and traditional pieces. I recommend pinning like crazy before purchasing anything. This will give you a feel for how your new and existing items will create the big picture: your space's fullness, palette, and overall mood. To keep your design focused, incorporate no more than 2-3 styles! STEP 3 / IDENTIFY OR CREATE YOUR "DESIGN BRIDGES"
Traditional Shape + Modern Frame. Image source. By now, you know which pieces you want to work with and the overall mood you want to create with them. Next, you'll want to identify your "design bridges." A design bridge is a single element that merges differing styles within a space. 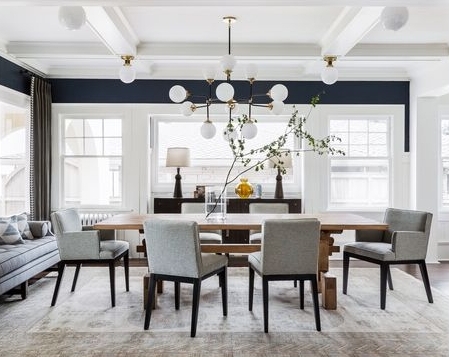 For example, a bridge could be a piece of furniture that mixes modern and traditional design, or a traditional coffered ceiling painted a modern color. Your bridges (it's okay to have more than one in a space) should be very calculated choices that fit your space's color palette, mood, and functional needs. 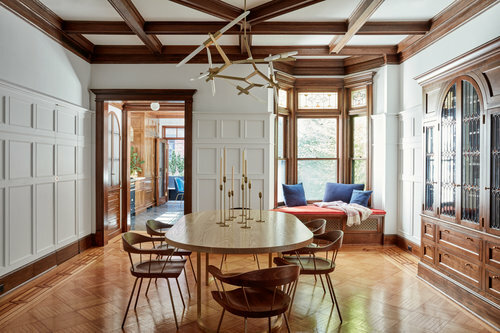 If your home's architecture is traditional and you like ultra-modern furniture, keep some consistency with the furnishings and the light fixtures you select. Lighten up the space itself, such as painting the walls white, to make the traditional architecture feel more modern. Wood interiors can often age and darken, so you may want to lighten them up by sanding and staining or painting a lighter color. Lightening up the walls with paint or a stain will also make a traditional interior feel more modern. 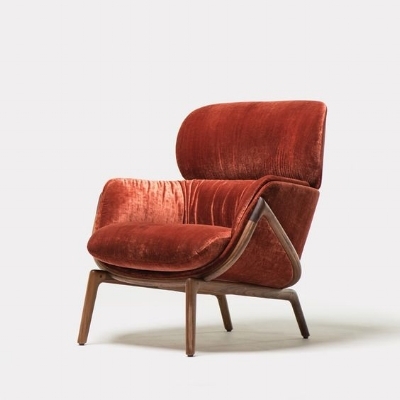 Find pieces whose designs already fuse modern with traditional. You can find some great examples below or in our Modern Traditional Pinterest board here. 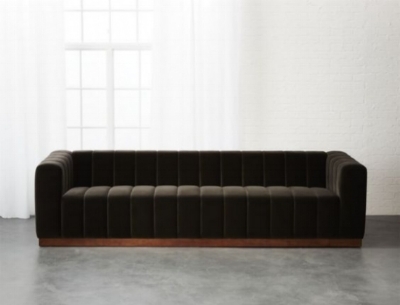 The clean lines and velvet channeling make this sofa a gorgeous addition to a modern traditional interior. Image source. 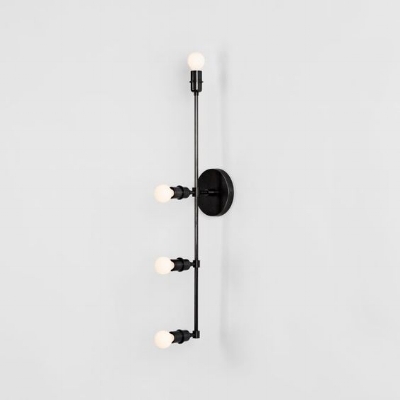 Traditional vanity-style bulbs paired with modern black piping. Image source. Tall candlesticks scream traditional, but the lean silhouette and the use of black (instead of a metal like gold or pewter) helps these blend into a modern traditional space. Image source. 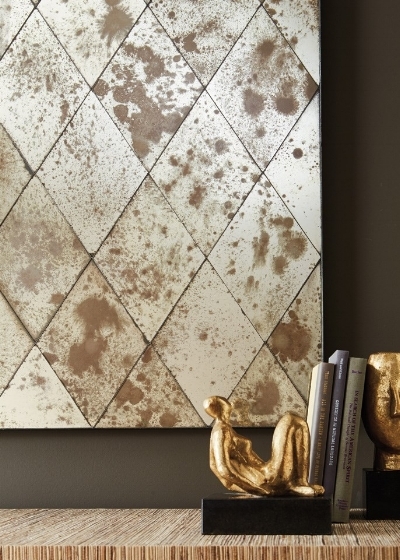 Antiqued mirror with a modern presentation. No traditional gilded frames here. Image source. Once you have your plan and piece selections, you're ready to pull the room together! You can assemble it all together at once or give yourself a more generous timeline of 5 years. ;) Either way, all that matters in the end is that you have a space that makes you feel proud and at home! For more inspiration, check out our Modern Traditional Pinterest board!